This one has to go down as one of the best inflight meal I’ve ever had, and it was just the appetizer! 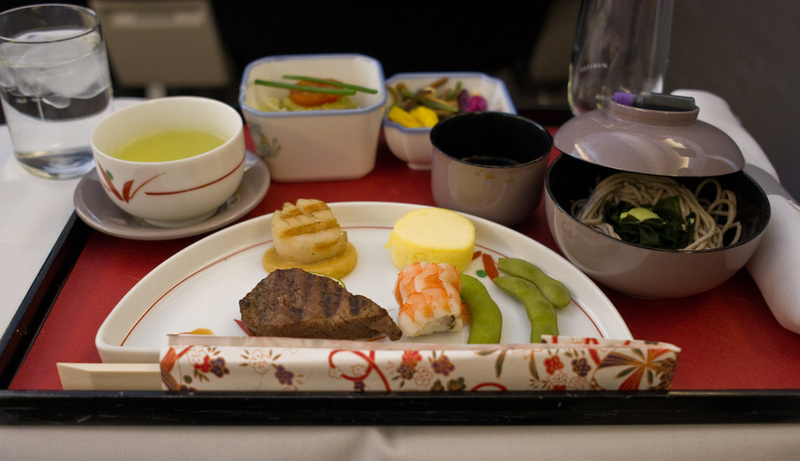 From United Airlines’ website: Washoku Zen is a traditional composition of a Japanese meal in small individual dishes served on a tray to a guest in Japan. The first course consists of individual appetizers, called “zensai” that are displayed and served in one-bite size portions on an attractive half moon dish, as well as the “kobachi” appetizer which contains vinegar marinated seafood. The “owan” or noodles are complemented with garnishes and “konomono”, or three types of Japanese pickles, are also part of the first course. Each item is an important piece of the total artistic composition carefully brought together to complement one another in a beautiful presentation. The second course consists of the entrée, “dainamono”, such as grilled or simmered fish with vegetables served with a bowl of steamed rice. Japanese tea is served throughout the meal.